How did you come up with the idea of building tree-houses? Blue Forest was founded by Andy Payne in 2003. Andy and I (Simon Payne) were born in Kenya where we were fortunate enough to have spent our childhood surrounded by the beauty and adventure of the great outdoors. Following completion of his degree course, Andy gained significant timber framing and construction expertise through a combination of business and voluntary experience in both the UK & Japan. This included the design and construction of a canopy walkway and tree house for a friend who runs a conservation project in Kenya. Blue Forest was born of these experiences and from a desire to bring people closer to the natural world. The name Blue Forest comes from the Japanese Region called “Aomori” meaning ‘Blue Forest’ – named after the ‘blue’ appearance of the distant pine forests in this mountainous region of Japan. What is the most bizarre-unique tree house that you have built? I think most of our tree houses probably seem bizarre to anyone who is not used to the concept of people building luxury tree houses! When you say the word “tree house” most people think of a few pieces of timber and palette up in the branches of a tree. As you can see from our website this is not the type of tree house we build. We have completed a wide variety of strange tree house requests, including installing: an Aga oven, hot tubs, home cinemas, offices, wet rooms, secret tunnels and even a tree house with a separate door for the fairies!! 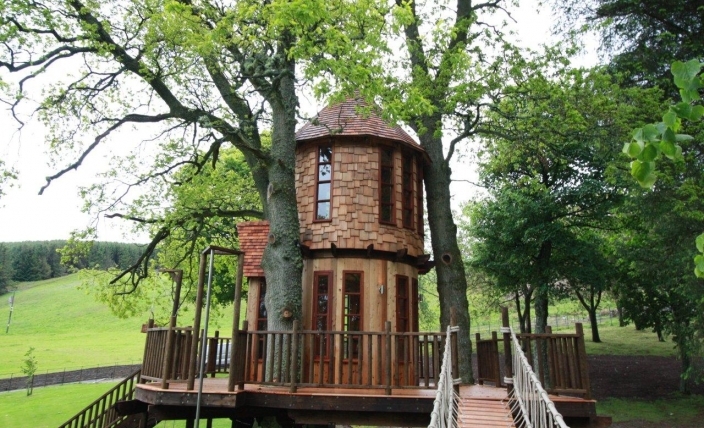 Which is your favourite tree house from your portfolio? Have you built a tree house for yourself (Not including the tree houses you built as children!!)? Shortly after we started Blue Forest we built a tree house as our office. Over the years we have out grown this space and so the tree house has now been converted in to a bed & breakfast for people who want to stay in a luxury tree house on their holiday. How much does a Blue Forest tree house cost? Our tree houses start at about £15,000 and “the sky is the limit”! We have had private tree house contracts up to a value of £450,000 and commercial projects in excess of £1.5 million. What ever your tree house dreams we are confident we can design the perfect hideaway for you. Do you have any projects on at the moment? Yes we are working on a number of different projects around the country, including tree houses for kids and adults. In addition to our tree house projects we are working on the following commercial schemes. Where are most of your clients from? What is next for Blue Forest? The latest development is a concept we have called the eco-PERCH. The eco-PERCH concept is based on Blue Forest’s famous tree houses. It’s natural, organic geometry maximises the relationship between the inside space and the outdoor setting, ensuring the structure sits harmoniously within the landscape. This versatile accommodation unit offers guests an unrivalled experience and provides clients with a vivid resource for PR and marketing, helping to set them apart from the competition. The building sleeps 4 people and is delivered, assembled and commissioned in approximately 5 days (subject to site preparation). The eco-PERCH design is flexible and can be adapted to suit your site where existing infrastructure is already in place. With options to assemble your building on the ground or in the treetops there are infinite possibilities for creating accommodation with a difference. To simplify the planning requirements the building has been designed to conform with the Caravan & Mobile Homes Act. Join the Blue Forest Team ….